A 28-year-old man diagnosed with autosomal dominant polycystic kidney disease (ADPKD) was referred for further management. The patient was diagnosed at the age of 4, when he presented with gross hematuria. Computed tomographic scan of the abdomen showed a septated cyst in the left kidney measuring 3.5×4.5×4.5 cm. 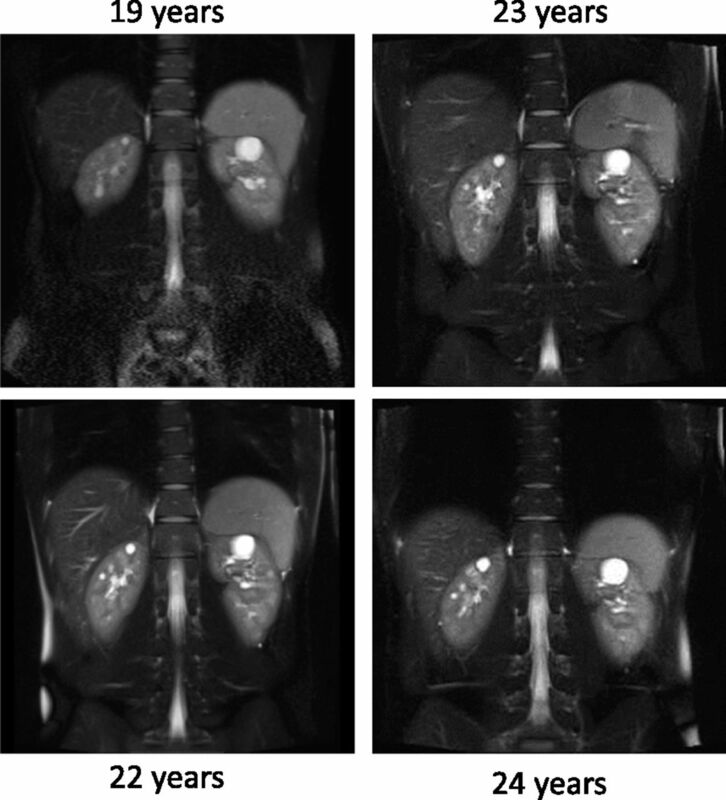 Two additional cysts measuring 0.5 and 0.1 cm in diameter were seen in the left and right kidneys, respectively. No kidney enlargement was appreciated, and the collecting systems were normal. Clinical laboratories revealed a serum creatinine of 0.4 mg/dl. He underwent cystectomy, and pathology revealed collagen deposition in the septa, consistent with a multilocular cyst. At the time of presentation, he had no family history of ADPKD, or intracranial aneurysms. Both parents were screened; the father (age 42 years) was found to have multiple cysts in his liver, and both kidneys consistent with a diagnosis of ADPKD. The patient was given a diagnosis of ADPKD at this time. The father was asymptomatic with normal kidney function and no history of hypertension, gross hematuria, or nephrolithiasis. A brother was screened at age 10 with ultrasound and did not show evidence of kidney cysts. The paternal grandmother passed away at age 85 from breast cancer, and the paternal grandfather passed away at age 38 of a myocardial infarction. The patient underwent bilateral inguinal hernia repair at age 5, and at age 15, he developed nephrolithiasis and underwent extracorporeal shock wave lithotripsy. He completed a 24-hour urine collection and was found to have a high calcium oxalate supersaturation, which was primarily due to low fluid intake. He developed borderline hypertension at age 17, and antihypertensive therapy was initiated with an angiotensin-converting enzyme inhibitor. Kidney ultrasound was performed at age 22 for dysuria, and the right and left kidney lengths were 11.7 and 11.9 cm, respectively, with multiple cysts in both kidneys. No liver cysts were appreciated. A single 9-mm stone and two 5-mm stones were seen in the right and left kidneys, respectively. He subsequently underwent bilateral lithotripsy. His BP remained under good control with monotherapy. At age 19, he was screened for an intracranial aneurysm using magnetic resonance imaging, which was negative. Repeat imaging at age 24 did not reveal evidence of polycystic liver disease. The patient showed a BP of 91/55 mm Hg and a heart rate of 89 beats per minute with a height of 175.3 cm, weight of 86 kg, and body mass index of 28 kg/m2. Cardiac examination revealed a regular rate and rhythm with no murmurs or edema in the extremities. Abdominal examination failed to reveal hepatomegaly or kidney enlargement. His examination was otherwise normal. Abdominal magnetic resonance imaging done at age 19 as part of a clinical trial (the HALT Progression of Polycystic Kidney Disease [HALT-PKD] Trial; NCT00283686) showed bilateral kidney cysts with a total kidney volume (TKV) of 376 ml (upper limit of normal for TKV is 404 ml) and a height-adjusted total kidney volume (htTKV) of 215 ml/m; height-adjusted total liver volume was 898 ml/m. During the next 5 years in the HALT-PKD Trial, his TKV increased by 5.9% per year, with a TKV of 487 ml/m and an htTKV of 278 ml/m at 24 years of age (Figure 1). As part of participation in HALT-PKD trial, screening for mutations in the polycystic kidney disease 1 (PKD1) and PKD2 genes was performed. No mutation confirmation was obtained with direct Sanger sequencing or multiplex ligation–dependent probe amplification. As part of a large genotyping effort, this patient was included in a multiconsortia effort to identify new genetic causes for ADPKD in 327 genotype-negative ADPKD families (1). Whole-exome sequencing analysis done in six participants with genetically unresolved ADPKD identified a missense mutation in the GANAB gene (Online Mendelian Inheritance in Man 60066) in one family. Sanger sequencing of the coding region of GANAB in our patient showed frameshift mutation, c.1914_1915delAG (p.Asp640Glnfs*77), and this mutation was confirmed in the affected father (1). Coronal T2-weighted magnetic resonance imaging scans of the abdomen at different time points show an increase in the cyst number and the cyst size over time. ADPKD is the most common hereditary kidney disease, and accounts for 5% of the patients with ESRD and 10% of patients under the age of 65 years old. It is characterized by the development of bilateral kidney cysts beginning in utero that ultimately expand and enlarge over time, resulting in progression to ESRD, typically in the sixth decade of life. GFR is typically preserved for decades in the presence of relentless growth of multiple cysts and increasing kidney size. ADPKD is a systemic disorder characterized by renal and extrarenal manifestations. Liver cystic involvement occurs in 85% of patients by 30 years of age. Cysts also occur in the pancreas and seminal vesicles. Cardiac manifestations include mitral valve prolapse, mitral and aortic regurgitation, left ventricular hypertrophy, and intracranial and coronary artery aneurysms. Other extrarenal manifestations include colonic diverticuli and abdominal and inguinal hernias. Renal manifestations include flank pain, decreased urinary concentrating ability, increased urinary frequency, nocturia, hematuria, hypertension, urinary tract infections, and nephrolithiasis; 27% of adults will have detectable proteinuria by urinalysis, and proteinuria is almost always <1 g/d. By age 30, >50% of patients with ADPKD will have had at least one renal complication. Cyst burden in ADPKD can be measured by calculating TKV or htTKV. The Consortium for Radiologic Imaging in Polycystic Kidney Disease (CRISP) Study showed that TKV increases in an exponential fashion due to cyst growth and development that typically begins in childhood. TKV predicts the future decline in GFR and typically exceeds 1000 ml before any decline in kidney function (2). Given that this patient represents a new genotype in ADPKD, it is not clear whether he also carries the same risk profile for a given TKV. However, his cyst burden or htTKV is low, below the threshold for risk for progression to CKD stage 3 in the near future for patients with ADPKD. Mutations in the PKD1 and PKD2 genes are known to cause ADPKD and account for over 95% of all cases. In a series where mutation screening is performed in already diagnosed individuals, genetic analysis fails to identify mutations in approximately 10%. In patients in whom no mutations are detected, disease severity is mild, less severe than in patients with PKD1, and similar to or less severe than in patients with PKD2. Our patient carries features that are atypical for ADPKD. There is typically a significant relationship between cyst burden (TKV) and the occurrence of renal complications, including hypertension, hematuria, nephrolithiasis, and proteinuria. Similar to adults, there is a relationship between the severity of cyst burden or TKV and the development of symptoms in ADPKD children. Our patient was symptomatic with hematuria, hypertension, and nephrolithiasis very early, also typically associated with significant cyst burden, whereas he only manifested mild ADPKD by cyst number and kidney length. Children with fewer than ten kidney cysts before the age of 12 years old or those with mild ADPKD (3) typically do not develop hematuria, hypertension, or nephrolithiasis. Longitudinal natural history studies in ADPKD indicate that the mean age for an initial episode of gross hematuria is approximately 30 years (4). Patients with episodes of hematuria have greater TKV compared with patients without hematuria (820±87 versus 588±52 ml) (4). In children, hematuria is not common, occurring in <10%–15% (4,5), and it occurs in those with larger kidneys (3). Hypertension occurs in 75% of adults with ADPKD before any loss of kidney function, with a mean age of diagnosis of 32 years in men and 34 years in women. Hypertension occurs in 10%–40% of children with ADPKD (3,5) and is more common in children with higher cyst number, bigger kidneys, and faster rates of kidney growth (6). Adult patients who are hypertensive also have larger kidneys than patients with ADPKD who are normotensive (7). In the CRISP Study cohort, in individuals who were normotensive, the mean TKV was 731±406 ml, almost twofold greater than in this patient (7). Our patient had symptomatic nephrolithiasis at a young age, which is atypical in ADPKD. Nephrolithiasis is the least common renal complication in ADPKD and occurs later than all other renal manifestations, occurring in only 28% of patients and those with significantly increased TKV (8). Nephrolithiasis is rarely seen in individuals with ADPKD under the age of 20. The metabolic abnormalities reported to contribute to the development of kidney stones in ADPKD include hypocitraturia, hyperoxaluria (8), and decreased urinary ammonia excretion in the setting of normal urinary acidification (8). During two evaluations of risk for stone formation, our patient failed to show any of these abnormalities and showed only decreased fluid intake that resulted in a higher than acceptable calcium oxalate supersaturation. ADPKD is most commonly caused by mutations in two genes. Approximately 85% of patients with ADPKD have mutations in the PKD1 gene, which encodes for polycystin 1 found on chromosome 16, and 15% of patients have mutations in the PKD2 gene, which encodes for polycystin 2 found on chromosome 4. Our patient did not have mutations in either the PKD1 or PKD2 gene, similar to approximately 64 other participants in the HALT-PKD Clinical Trial. Although these patients showed a variable level of severity in both polycystic liver and kidney disease, the degree of cyst burden of the patients without PKD1 or PKD2 mutations was strikingly lower than that in the participants with PKD1 or PKD2 mutations confirmed in the HALT-PKD Trial. Our patient and his father showed a mutation in a novel gene GANAB located on chromosome 11q12.3, which is closely related to a gene known to cause autosomal dominant polycystic liver disease (ADPLD), PRKCSH. Mutations in the GANAB region were identified in eight additional families and account for approximately 3% of PKD1- and PKD2-negative families with ADPKD. Glucosidase II is a protein located in the endoplasmic reticulum and has two subunits, a catalytic (α) subunit and a noncatalytic subunit (β). Glucosidase IIα is encoded by GANAB, and glucosidase IIβ is encoded by PRKCSH. Both subunits are necessary for proper functioning of glucosidase II. Most secretory proteins and transmembrane proteins undergo translocation to the endoplasmic reticulum and go through their protein folding process and quality control in the endoplasmic reticulum. Glucosidase II is involved in the glycoprotein processing and facilitates protein folding by catalyzing the hydrolysis of the glucose residues from the glycan bound to the proteins. The protein folding is subsequently initiated by the endoplasmic reticulum chaperones, calnexin and calreticulin. Another protein SEC63p encoded by SEC63 is located in the membrane of the endoplasmic reticulum and required for protein transport across the endoplasmic reticulum membrane during protein translation and transport of misfolded proteins from the endoplasmic reticulum back to the cytoplasm (9) (Figure 2). Mutations in either PRKCSH or SEC63 cause ADPLD associated with a mild kidney cystic phenotype. Unlike in ADPKD caused by mutations in PKD1 and PKD2, where there is a reduction of functional polycystin 1 or polycystin 2, mutations in both PRKCSH and SEC63 reduce expression and effective trafficking of functionally active polycystin 1 (10). Mutations in GANAB can cause ADPKD and autosomal polycystic liver disease due to defects in protein maturation and cell surface localization of polycystin 1 and polycystin 2 (1). It should be noted, however, that patients with ADPLD caused by mutations in PRKCSH and SEC63 have a less consistent phenotype than patients with GANAB disease, in whom kidney cysts have been uniformly found to date. ADPKD caused by GANAB mutations is mild but variable within families. We have little information regarding the phenotypic features of patients with GANAB mutations. Clinical features reported in 20 patients from nine different families with mutations in the GANAB region are summarized in Table 1. It is unclear if GANAB mutations causing ADPKD have been associated with early-onset hematuria, nephrolithiasis, hernias, and hypertension as seen in our patient. A more systematic and detailed study of the phenotypic features of patients with ADPKD and GANAB mutations is now needed. Protein folding and quality control process in the endoplasmic reticulum. (1) Nascent polypeptide (polycystin 1) enters the endoplasmic reticulum through the SEC61 complex, which is composed of three subunits of SEC61 and further associated with SEC62 and SEC63p. (2) In the endoplasmic reticulum, the glycan is transferred to the nascent polypeptide by oligosaccharyltransferase. (3) Glucosidase I cleaves the first glucose residue. (4) Glucosidase II composed of α- and β-subunits cleaves the second glucose residue. This allows the nascent peptide to enter the protein folding calnexin and calreticulin cycle. (5) During this step, glucosidase II removes the innermost glucose from the glycan, thus releasing the protein from the chaperones. (6) If the protein is properly folded, it is transported to Golgi. 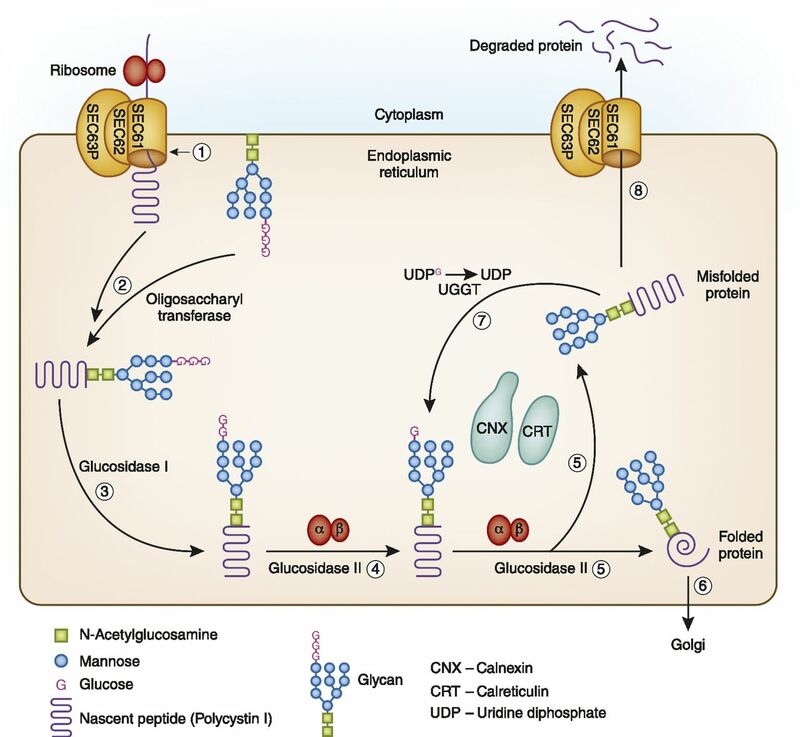 (7) The misfolded proteins are reglycosylated by UDP-glucose glycoprotein glucosyltransferase (UGGT), allowing more time in the folding calnexin and calreticulin cycle. (8) Proteins that fail to fold will eventually be transported back to the cytoplasm for degradation through the SEC61 complex. This case represents an individual with ADPKD who was symptomatic at a young age, despite having a modest structural involvement of the kidney. It illustrates the importance of performing genetic testing in patients with ADPKD and atypical presentation. B.V.R. is the principal investigator for the Replicating Evidence of Preserved Renal Function: An investigation of Tolvaptan Safety and Efficacy Study, which is investigating the use of tolvaptan in patients with autosomal dominant polycystic kidney disease (ADPKD) with CKD stages 2–4 and sponsored by Otsuka Pharmaceutical Development and Research, Inc. (the manufacturer of tolvaptan). Additionally, B.V.R. is the principal investigator for a phase 3b, multicenter, open label trial to evaluate the long-term safety of titrated immediate release tolvaptan in subjects with ADPKD sponsored by Otsuka Pharmaceutical Development and Research, Inc. (the manufacturer of tolvaptan). A.B.C. is a member of the Otsuka Pharmaceutical Development and Research, Inc. steering committee. We thank the HALT Progression of Polycystic Kidney Disease Trial investigators, the participants, and their families. Supported by grant from the National Institute of Diabetes and Digestive and Kidney Diseases (DK62408 to Dr. Chapman). The genetic analysis was done at the Mayo Clinic (DK62410 to Dr. Torres).